Smart Play is an educationally friendly company which is also committed to bilingual learning. All of their products are geared for bilingual learning. Smart Play has offered me a Smart Projector to review! The Smart Projector is designed for children ages 3 & up. It’s extremely simple to use. Pull it out of the box, pop the two base arms on, and you’re ready to go! Great for use in the classroom or at home! Insert one of the little round discs into the machine, flip the light switch on, and it then projects the image onto the paper to trace. The discs include Animals, Alphabet Letters, Numbers, and English/Spanish words. It has sections on the side arms to hold crayons as well as slots to hold the discs. You can even make the neck of the projector lower and higher to change the size of the pictures you are drawing. No wonder it received the 2009 Preferred Choice Award from Creative Child Magazine! After inserting a disc, placing paper on the table, then flipping the projector light ON, the child can then practice writing letters of the alphabet, numbers, tracing animals, and also writing the names of that animal in English and Spanish on the paper provided. I was very eager to try this Smart Projector out. My 3 year old son knows all of his letters & their phonetic sounds, as well as some spelling, but he absolutely hates drawing or trying to write/trace letters. I have worked with him in tracing workbooks which he likes for a little while, then gets bored of very quickly. For the life of me I just cannot get him to trace or write a letter-until now! This Smart Projector really peaked his interest because it is so simple for him to do it himself. And to have his own projector with lots of things to twist and interchange? What could be better?! I couldn’t believe it. I thought he’d be interested for a little bit and then run off to do something else, but he spent more than an hour at his Smart Projector the first night we pulled it out of the box. He only stopped because we made him go to bed. The next several days after we received our Smart Projector he has asked several times a day to use it! He is finding a lot of pride in being able to write “octopus”, “sheep”, and other lengthy words all by himself! My son can’t even draw a straight line, and after receiving his Smart Projector he is happily tracing away whole words and coloring the animal projections on his paper! 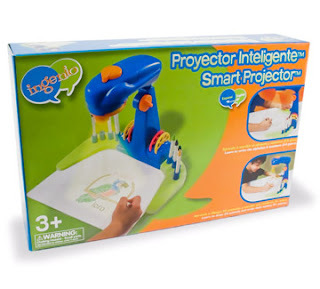 The Smart Projector is a great way to encourage children to learn how to write, to help left handed children write better, to teach both English and Spanish words, and even teach them to draw different shapes! This is a superb tool for helping to improve minor motor skills! I love that the Smart Projector entices my son to write his letters and try tracing animals. I love the sense of pride my son has when he shows me he wrote “elephant” on his paper! I love that this is so simple my 3 year old can do it himself without my help except for helping him change his discs (the eject button is a little hard to push). I love that you can use this projector in a well lit room or in a dark room! I also love that a child can use this who is left handed OR right handed. (My son is left handed which sometimes makes projects a bit harder.) I am always looking for things to improve my son’s slow minor motor skills and this is an incredible way to do so! The only thing that I have found I do not like about the projector is that you can not hold the crayon “properly” because your hand will block the projector light and you cannot see to trace. But my son quickly learned to hold his crayon slightly to the side in order to see the lines and has had no problem writing that way. Considering that my son refused to even try and write a letter or draw a line before he received his Smart Projector, I can handle him not properly holding a crayon for a while! You can buy other great bilingual products from Smart Play (Ingenio) on Amazon! I like the opposite learning cards. If I win I would use the projector for my classroom. If I won, I would give the Smart Projector to my daughter. I like the My First Notebook. The North American map puzzle looks cool! My 3 year old daughter will use this! She says she's going to be an artist when she grows up, and I believe it. She's good! The opposite learning cards caught my eye. I would give the smart projector to my son. I like My First Notebook. i like the animal puzzles. my son would be using this smart projector- i know he would enjoy it. I would also like to have the easy translator! I think both of my boys would use this! They are 5 and 2. I would love to have this for my son, he would love it and that would make it easier for him to learn to write (he is left handed). I love the Spellable game from the site!! I love the North American Map Puzzle too! I would keep this for our baby! Would love to win! My daughter would be using the projector. I like the North American Map puzzle. My girls adore puzzles, so it'd be an instant hit here. The My First Notebook looks really cool. I am sure my one daughter would love it. This would be for my 5 year old. The math-o-matic game looks good. The Animals puzzle would be fun and educational. This would be for my 4 year old granddaughter. Posted this giveaway on my facebook status. my nephews will be loving this projector!! I will be giving this to my youngest grandson, who loves to draw! I like the spellable educational game they offer as well. This smart projector would be used by my son as well as the older daycare children that come to my house. Another product we like is the My First Notebook learning toy. Thank you for the great give-away. My 3 1/2 year old son would be using the Smart Projector! He is learning how to spell his name and his pictures are slowly but surely becoming more and more identifiable so this would be wonderful for him! I follow you on facebook! Petes sake is my name on there! I love the animal puzzles. I also like the My First Notebook from Smart Play. This projector would be perfect for my children. I would love to get my oldest son the North America Map Learning Puzzle. I would love to win this for my youngest son. I like the North American Map Puzzle ~ as a homeschooling family of 4 this would be a great learning tool. If I win, this will help our 5 yr old (also a left-handed child) learn to write his ABC's, numbers and name. I am a new GFC follower and looking forward to reading more. I like the alphabet edition learning puzzle. The My First Notebook really caught my eye. Thank you for the lovely giveaway. I would be using this projector in our learning studio. Thanks so much! The easy translator is a neat game/tool for our children who are taking Spanish classes in elementary school. The smart projector would be for my daughter. I like the Alphabet Learning Puzzle. I like the NOrth American map puzzle. My twins would be using this projector. And of course Mommy would have to try it out as well. My Bebe Boy James currently has a fixation with geography (atlases, maps, etc. ), so the thing that caught my eye most was the North American Map Puzzle! I like the Math-o-matic™ game. If I won, I'd be giving it to my niece and nephews. They'd really love this! I like My First Notebook! I like the Spellable™ Educational Game.